Recently, I’ve been receiving a lot of questions about skincare. How To achieve my skin and what products to recommend especially on those who are very new to the skincare game. And if you’re not new to the world of beauty, you’ve probably know already what to expect from this review by just glancing at the photos. Coz yes, we are going to talk about my long-term relationship with the Missha Time Revolution Duo– First Treatment Essence & Night Repair Ampoule. I first heard these from my fav beauty influencer Jen Kim (@meejmuse) . It was so hyped before and it’s a total dupe of the SKII’s Toner and Estée Lauder’s Night Repair Serum which I’ve tried before and sworn. But I can’t keep up with the price for an everyday use 😣 and I’m glad I found alternatives that give the same effect . These two have been my constant PM companions of 3 years! They have never failed me and even if I have new products, so still keep on going back to them. I don’t know if it’s just my mentality or my attachement but using them changed my skincare game. For some reasons, my skin just like them so much that I must say, it’s on the top list of my recommend product! DISCLAIMER: I am not a skin expert. Not everything that works for me might work for you and vice versa. It’s still best to personally know your skin first before trying different products and routines. I suggest to consult to your personal dermatologist to determine which products suit to your needs if you’re not really sure. CONCERN: Enlarged pores & Aging skin. Back in 2015, I wasn’t aware of how Korean Toners/Essence work. But due to the influence of so many YouTubers like Jenny (forever fan), my curiosity finally pushed me to give it a go. I am aware SKII and this one are specifically for aging skin but I was eager to start taking care of mine since I’m at my 20s already. I originally purchased first the travel minis to try them out first coz it’s a little pricey even if it’s on sale and I don’t want to spend on something that doesn’t work for me. I originally purchased 3 samples and I liked it so I bought already. I didn’t purchased it individually because most online stores like “STYLEKOREAN” do better deals with bundles so I was also able to get the ampoule with it. *** I recommend this to everyone and if your struggling from oily skin, this is one of the best to toners for you. You can freely do the ‘7 Skin Method’ with this. It’s in a frosted-glass bottle and the thickness of the material is way thicker than the serum because my daughter both smashed and dropped them but nothing happened to it. The ampoule was the only one totally destroyed. Overall I like the packaging because you can see and feel that it is high quality even though it’s heavy. But I also want to mention, that this year they released a new packaging with a spray and it’s so much more convenient to use as everyone say so if I’m gonna purchase again, I’ll just get the spray bottle form. It is super light like water. It isn’t like the other toners/essences that has this viscid texture. Due to its lightweight form, it absorbs very quickly although I have so many experience that I put too much on my hands and it leaks out. Over all I have no problems with it. I used to only apply this during night time but recently I’ve been also using this as my AM Toner since I don’t have any issues with it even during extreme hot days. It’s superstar ingredient is the 90% fermented yeast from Himalayan purple barley for effectively plumping the skin, refining skin texture, and reduce pigmentations. While Niacinamide brightens and clarifies skin tone and adenosine energizes skin for youthful skin. It is light and refreshing and I sometimes use it for my #7skinmethod alone. I totally believed my consistent use of it helped control the oils of my skin making it less prone to sebum production and acne. My skin overall looked brighte with it! 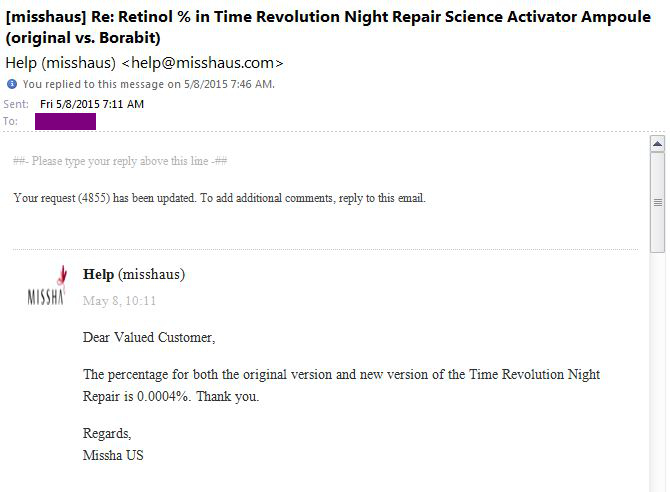 Missha Time Revolution Night Repair Science Activator Borabit Ampoule is an anti-aging serum that claims to brighten and smooth aging skin. BEST FOR: Aging skin, all types. ***It is safe to use even for sensitive and oily skin but I don’t recommend this for AM use since it’s quite heavy (just personal experience). I just died seeing this product dropped and be shattered into pieces. It’s obviously not baby proof and I really feel bad that I wasn’t able to use up at least half of it. I wasn’t able to get the remaining products because it already everywhere and I feel unhygienic to still scrape them and still use it on my face. Though I might say I love the packaging coz it’s very classy. It has a glass container with a glass pump you can feel the extra effort Missha has exerted on its packaging. If you don’t have a baby and you’re not clumsy, I don’t think you’ll have any problems with this. As the name said, it is an ampoule and it really does feel like an ampoule. It is liquidy with an enough viscosity but not sticky at all though I only use this at night coz it’s a little heavy for Am routine. It leaves my skin silky smooth which is so satisfying to touch. I use it every night after Toner and It leaves my skin bouncy and bright the morning I wake up. I always make sure I use this serum when my skin is bad and dull. The key ingredient for this anti-aging serum is Bifida Ferment Lysate, a fermented yeast that visibly reduces signs of aging and improves skin elasticity while protecting the skin. The first thing I look for into my night serums are the retinol percentage, which turned out to be 0.0004%, meaning to say the balance of content partition might not be that good. Think about it, in a bottle all of the ingredients can be present? It’s like I’m on the verge of how it could all fit there with the enough amount of good ingredients to really affect the skin. Even though I was hesitant about the super technical ingredient list, I still use it coz this 2nd bottle was given to me by my mom and maybe it’s my head already saying that it works coz of the products sentimental value over the years. But if you’re gonna ask me, I really can’t say if it work coz I still have my 20s skin and I’m skincare, it’s hard to see immediate results. I just wanna think its the type of product that takes time to see results or for my part its a preventive aging product that’s why I’m not seeing drastic results. For now, I’m thinking not yet because my skincare stash is so full and I have so many products yet to finish even after using these up. But if I will repurchase, it might be the Essence alone in the spray container. It really worked wonder for my skin but as for the ampoule, I might pass. I used so many serums and ampoule and I think it’s not the best considering how it’s also quite pricey. Currently, StyleKorean is having a 50% sale for the bundle and I think Althea is also having one so it’s just a matter of preference. So hurry up!! !